Singin' in the Rain is a musical with a book by Betty Comden and Adolph Green, lyrics by Arthur Freed, and music by Nacio Herb Brown. The original West End production, directed by Tommy Steele and choreographed by Peter Gennaro, opened on June 30, 1983 at the London Palladium, where it ran until September 1985. The original cast included Steele as Don, Roy Castle as Cosmo, Danielle Carson as Kathy, and Sarah Payne as Lina and Julia. The original film's vocal score was embellished with additional tunes by Comden, Green, and Roger Edens, Dorothy Fields and Jimmy McHugh, George and Ira Gershwin, Johnny Mercer and Richard Whiting, and Cole Porter. In 1989, the United States Library of Congress selected the film for preservation in the National Film Registry. The unbridled joy of Gene Kelly splashing through puddles make this song one of the most memorable musical comedy numbers of all time! A great choreography showcase for choirs of all types - audiences will love it! 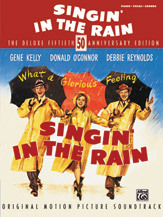 Alfred is pleased to release Singin' in the Rain: Deluxe 50th Anniversary Edition. Singin' in the Rain, starring classic film stars Gene Kelly, Donald O'Conner, and Debbie Reynolds, is considered one of the best musicals ever made. This book features music from the movie, providing the lyrics along with piano and chord arrangements for all the songs included. Titles: All I Do Is Dream of You * Broadway Melody * Broadway Rhythm * Fit As a Fiddle (And Ready for Love) * Good Morning * I've Got a Feeling Your Foolin' * Make 'Em Laugh * Moses * Should I * Singin' in the Rain * Temptation * The Wedding of the Painted Doll * Would You? * You Are My Lucky Star * You Were Meant for Me. Who can hear this wonderful show tune without picturing Gene Kelly singin' and dancin' in the driving rain, umbrella in hand! 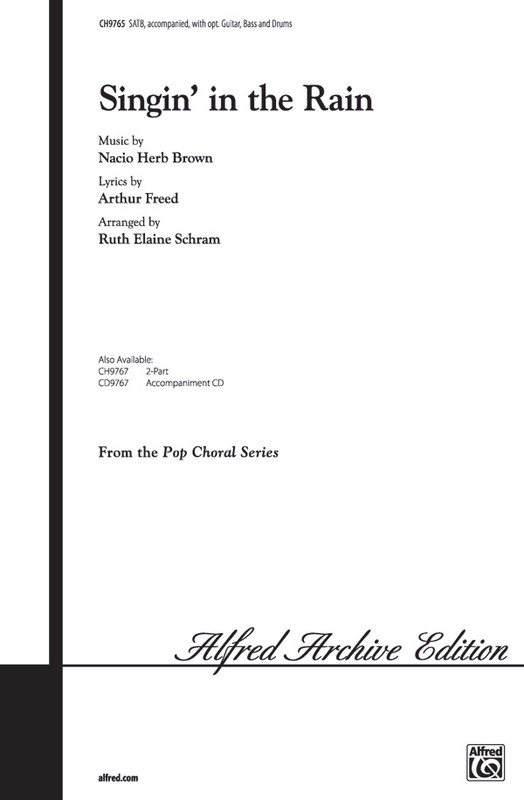 Ruth has captured the wonderful sense of the original and added her own touch of lovely voice-leading to make the most of this extraordinary song. A touch of movement could enhance any performance. The unbridled joy of Gene Kelly splashing through puddles makes this song one of the most memorable musical comedy numbers of all time! A great choreography showcase for choirs of all types - audiences will love it!